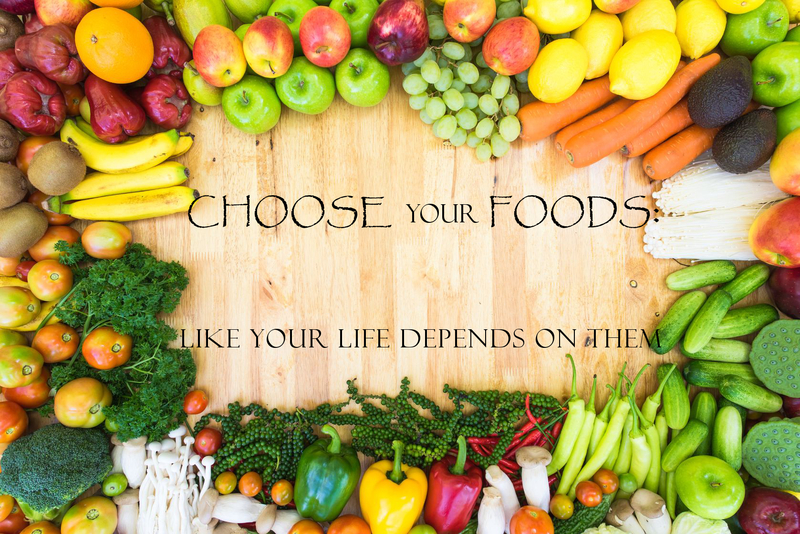 The following is a talk I gave at Changing Hands Bookstore in Tempe, Arizona during my book signing for Choose Your Foods Like Your Life Depends On Them. “Let me tell you a little about myself and my practice. I am Colleen Huber, a Naturopathic Medical Doctor here in Tempe, Arizona. Naturopaths are physicians who have four years of medical school after the bachelor’s degree, and are licensed to practice both conventional and natural medicine, and of course we emphasize the latter, the natural medicine, but we make use of conventional medicine when necessary or warranted. Naturopathic medical students must take more than twice as many classroom hours as conventional medical students. This is because we are trained then licensed to practice both their medicine and ours, both pharmaceuticals and natural medicine. Most people don’t realize this, and assume that their medical doctors know something about nutrition. However, as Andrew Weil has pointed out, nutrition education in the regular medical schools is substandard to non-existent. So when you go to your medical doctor and ask, “Do you think I should be taking zinc or Vitamin C?” the doctor is literally GOOGLING the same exact articles you are to try and find the answer. When it comes to nutrition, or even advanced biochemistry, which is what nutrition is, most doctors do not have a clue. For decades the medical profession declared that it does not matter what you eat. And they are to this day still telling that to diabetics and cancer patients! Patients of naturopaths on the other hand have somebody knowledgeable to discuss their food choices with. You may have noticed the title of my book is Choose Your Foods Like Your Life Depends On Them. This may seem a strange sort of instruction. For most animal species, except for the most domesticated, it goes without saying. You eat this leaf: you’re okay; you eat that leaf you die. For our human ancestors until just a few generations ago, it went without saying that if you choose the wrong foods you get sick and die. Now however we live in the most abundant and wealthy society the planet has ever known, and the entire smorgasbord buffet is always in front of us, in the form of endless supermarket selections and a plethora of choices elsewhere. All of us know that we “can” eat a whole chocolate cream pie whenever we want. As adults, we have no one to stop us. For our ancestors, their appetites may have been just as voracious, but were kept in check by more limited availability and periodic famines. But none of us living here and now have ever really known hunger or even limited food offerings. So you can gorge till you drop and there is no one to stop you. BLIND FAITH IN SYNTHETIC CHEMICALS? Another aspect of our recent history has been the blind faith in synthetic chemicals that has characterized our lives since the 1940’s. The DuPont advertising slogan “better living through chemistry” became an article of faith, and ever since then we have believed, and swallowed and inhaled and injected such an enormous amount of industrial toxins that most people’s health is seriously compromised as a result. More than 80,000 new chemicals have come into consumer products, and have come in contact with our bodies, since the advent of the petrochemical industry. Human fat tissue sampled in the United States has shown more than 700 chemical compounds that have not even been identified. Of those chemicals found in our blood and fat that have been identified, many have been found to be cancer causing or nerve damaging. PESTICIDES ARE DESIGNED TO KILL, PERIOD! Speaking of nerve damage, some of the worst toxins that remain in our body, in our liver, fat and bones, are pesticides. The naiveté that we have shown as a society has been astounding when you consider that pesticides for the most part kill insects by destroying their nervous systems, which is the connection between the brain and the muscles and between the brain and the rest of the body.There’s an old bumper sticker that is worth repeating: “Pesticides don’t know when to stop killing. Eat organic.” What the bugs ate on the apples that killed them is still on and in the apples, all the way to the core, and is now wreaking its havoc on you. So let me get to the point: you know that toxic chemicals and refined and processed foods are slowly killing most of the people you know. You already know that, because of this understanding, those of us here right now are going to have a better outcome and longer life. We get another benefit: life will be more healthful and enjoyable all along the way. There is no greater wealth than to have a comfortable, painless body and to move freely with it. Yet many adults in our society have lost this very fundamental ability.There is an even more basic understanding before you begin to eat healthy food, and it is this: We inherited the bodies of our distant ancestors. We don’t have the 21st century model. Whether you believe in creation or evolution, it doesn’t matter. The liver was designed by God or nature or both a very long time ago, and that’s the same model of waste processing system that our bodies are using even now in the 21st century. The ancient model of the liver and other toxin-processing systems are the only ones still in use. So this is where my discussion inevitably comes to: what did our ancestors eat, and even more urgently, what did they not eat? Let’s consider the following: Organic food was never a fancy luxury. It was the only food available till just a few decades ago when pesticides came into use. Our great-great grandparents did not eat organic on special occasions or when splurging. All of their food was organic everyday. Processed food was unheard of until a few decades ago. Packaged food with dozens of barely pronounceable ingredients had no place in your ancestors cupboards, and they have no place in yours either. The toxic effects of food additives have been well documented in scientific research. It has been pretty conclusively shown that if you want to drive a child to mental illness, keep feeding that child artificial colors and artificial flavors and sweeteners in their food. The big stumbling block of course is sweeteners. Again, let’s look at what our ancestors ate. At the turn of the century, in the year 1900, the average American had one Dixie cup full of sugar per person per year. These days there is more than that in the average Big Gulp soda, which some people drink on a regular basis. Sugar is such a huge problem that Nancy Appleton’s article 141 ways that sugar can ruin your health documents known damage from head to toe and in every body system wreaked by simple sugars, such as those in sugar cane, corn syrup, and even worse by the neurotoxins of the artificial sugars such as Splenda, Sucralose and aspartame. So what can you use to sweeten your food? Stevia is a plant extract that does not raise blood sugar or insulin levels. It is a little hard to handle because the powder gets airborne easily, so I recommend the liquid drops of stevia. Aside from that, I have to recommend that you eat the basic fresh vegetables, fruits and meats that our ancestors ate, in that order, with vegetables being the biggest part of your diet, then fruit and meat, and as much organic as you can get. Those basic foods are so nutrient-dense that they will actually fill you up most of the time and satisfy your cravings within several days to a few weeks. The desperate need for sweeteners will subside to a mild craving and then just go away when you eat a good variety of vegetables, fruits and meats. In addition, to the extent you can tolerate it, dairy can also be added to these foods. Also, many people can tolerate whole grains, and some cannot. For more specific guidelines about healthy foods, as well as why and how to avoid toxic foods, I have to recommend that you read the book. I also highly recommended you read our new study showing how sugar fuels cancer growth.